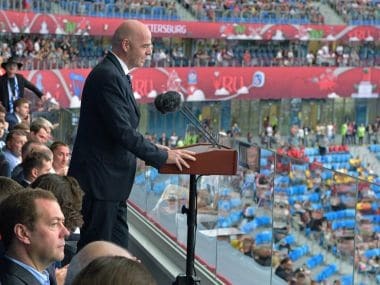 FIFA president Gianni Infantino on Monday strongly defended the use of video assistant referees (VAR) during the first round of group-stage matches at the Confederations Cup in Russia. The latest of the five decisions to go to review was when the video assistant awarded Australia a goal in their 3-2 defeat to Germany on Monday, despite replays appearing to show a handball from eventual scorer Tomi Juric in the build-up. There was also confusion on Sunday as Eduardo Vargas saw his apparent goal for Chile ruled out for a marginal offside over a minute after he had started his celebrations. "I am extremely happy with VAR so far," Infantino said in a statement on the FIFA website. "We have seen how video assistance has helped referees to make the correct decisions. That is what VAR is all about. "The VAR tests used during this Confederations Cup are also helping us to improve the processes and fine-tune communication. "What fans have been waiting for over so many years is finally happening. This is a milestone tournament. "Video assistant refereeing is the future of modern football." 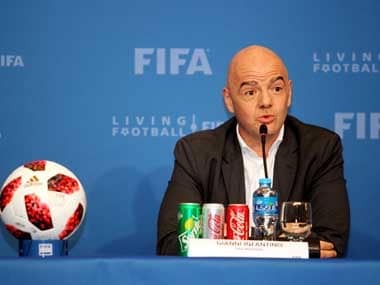 In April, Infantino said that the technology would be used at the 2018 World Cup after "very positive feedback". The International Football Association Board (IFAB), which governs the laws of the game, authorised VAR to be used on an experimental basis in March 2016. 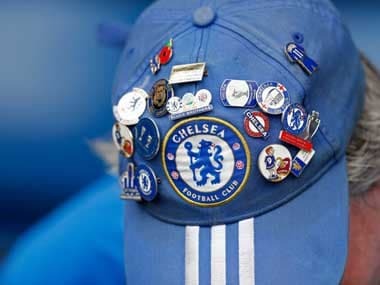 It can only be used to decide whether or not to award a goal or a penalty, for straight red cards and in cases of mistaken player identity.